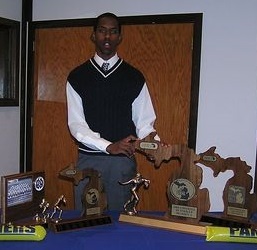 Ken was named on the first team Associated Press Class B as a defensive back in 2004. Ken was a defensive back on the 2004 defensive team that was one of the stingiest defenses ever. Playing safety behind one of the most talented quartet of linebackers in DeWitt Football history, Ken made the most of his 6’4” stature by picking off a record 15 passes. His reading opposing quarterbacks and cat quick reactions let the linebackers concentrate on stopping the run. By far, the most exciting play made by Ken was the regional final win over Pontiac Notre Dame Prep by intercepting a pass in his own end zone and returning it 106 yards for a game sealing touchdown. Ken went on to become a walk-on player at Central Michigan University.